The system uses eight lettered zones which are divided by major state highways. Each county road in the system is designated with the zone letter followed by a number. Six of the zones, A–F, are in the Lower Peninsula while the Upper Peninsula is divided into the remaining two, G and H. There have been a total of 66 different highways designated in seven of the zones; as of 2015 no E highways have been named. Participation by the county road commissions is optional, and not all counties use the system. One additional highway, H-16, has appeared on state maps since the 1980s although it is not a part of the system. Of the highways designated, two were removed from the system and later partially restored. When the Interstate 196 (I-196) freeway was built in the Saugatuck area in the 1960s, US Highway 31 (US 31) was shifted to the new freeway. The former route along Blue Star Highway was returned to county jurisdiction, which removed the various state highway markings from the roadway and displaced Blue Star Highway from the state highway maps of the time. At the time, Mr. and Mrs. Howard and "Gene" Temple owned a motel along the roadway in Saugatuck, and they were dismayed over the number of canceled reservations they were receiving because guests could not find their business. Mrs. Temple approached the Village of Saugatuck and the local chamber of commerce to get better highway markings for the area. She even contacted state legislators and members of the State Highway Commission. No changes were made, even though businesses along Blue Star Highway were suffering from a lack of traffic. Mrs. Temple contacted officials at the Allegan County Road Commission and the County Road Association of Michigan in August 1968. State Senator Gary Byker of Hudsonville was also contacted, and he convened meetings with representatives on the state, county and local levels in search of a solution. These meetings resulted in a test program for the 1970 state highway map that marked Blue Star Highway as A-2; the Allegan County Road Commission spent $2,000 (equivalent to $10,200 in 2018) to erect about 50 markers along the road in their county. A second road in the Upper Peninsula was designated B-1 between Engadine and Rudyard in Mackinac and Chippewa counties. Both county roads on the state highway map contained the caption "Experimental Program for Identifying Key County Roads". The markers used were the blue and yellow pentagon shields developed by the National Association of County Engineers. Mrs. Temple earned an honor as the first woman in "Michigan to obtain a highway designation from the State Highway Commission". The program was implemented by October 5, 1970, and expanded in scope. 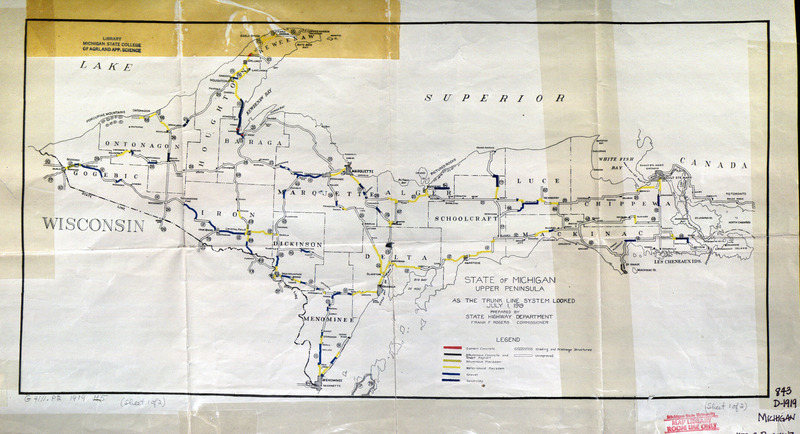 Instead of using designations beginning with an A for county roads in the Lower Peninsula and with a B for those in the Upper Peninsula, the system was divided into eight zones. The first of these revised assignments were shown on the 1971 state highway map; A-2 retained its number but B-1 was renumbered to H-40 in the Upper Peninsula. Earl Rogers, the engineer-director of the County Road Association of Michigan stated at the time that the county road commissions would gradually phase in signage over the coming years. Participation in the system was made optional, but all counties had agreed to the system. As of 2015[update], no counties in the E zone have assigned roads to the system, and many counties in the other zones have yet to participate. The system comprises 1,241.614 miles (1,998.184 km) of roadways. As implemented in October 1970, the CDH system is divided into eight zones: six in the Lower Peninsula and two in the Upper Peninsula. This contrasts to the state highway system that makes no attempt to group designations by geography in the state. The boundaries for each zone are determined by major state trunkline highways on each peninsula. Each highway is given a designation composed of the zone letter followed by a two-digit number. Within the zone, numbers are assigned on a grid system: north–south highways use odd numbers and east–west highways have even numbers. Lower numbers are used to the south or west sides of the zones. The A zone is bordered by I-96 on the north and US 127 on the east. The other two sides are formed by the southern state line with Indiana and Ohio and the western boundary along Lake Michigan. The B zone is bordered by I-96 on the south, Lake Michigan on the west, US 10 on the north and US 127 on the east. The C zone is bordered by US 10 on the south and both I-75 and US 127 on the east. [a] The northwestern boundary is Lake Michigan and the Straits of Mackinac. The D zone is bordered by US 127 on the west, I-96 on the north, the Detroit River and Lake Erie to the east and Ohio to the south. The E zone is bordered by I-96 on the south, US 127 on the west, US 10 and Saginaw Bay on the north and Lake Huron on the east. As of 2015, no highways have been designated in the E zone. The Upper Peninsula is divided into the G and H zones. The dividing line between the two zones is US 41, between Lakes Michigan and Superior with zone G to the west of US 41 and zone H to the east of it. 8.371 13.472 M-106 in Gregory D-19 in Pinckney Livingston 01970-01-011970 current Also called the "Highway to Hell"
^ a b Since C-64 and C-66 keep their designations across I-75, M-27 likely forms part of the boundary as well. ^ a b c d "County Primary Road Marking System Okayed". The Holland Evening Sentinel. October 5, 1970. p. 6. ISSN 1050-4044. OCLC 13440201. Retrieved May 17, 2017 – via Newspapers.com. ^ a b c Michigan Department of Transportation & Michigan Center for Shared Solutions and Technology Partnerships (2009). MDOT Physical Reference Finder Application (Map). Michigan Department of Transportation. Retrieved January 19, 2016. ^ a b c "Blue Star Highway Gets Additional Road Signs". The Holland Evening Sentinel. May 5, 1970. p. 18. ISSN 1050-4044. OCLC 13440201. Retrieved May 17, 2017 – via Newspapers.com. ^ MDSH (1970), §§ C9–C11. ^ a b MDSH (1971), §§ C9–C11, M7–L8. ^ MDOT (2015), full map. ^ MDSH (1970), §§ M7–L8; MDSH (1971), §§ M7–L8. ^ MDSHT (1977), § L8; MDSHT (1978), § L8. ^ MDOT (1982), §§ L8–L9; MDOT (1983), §§ L8–L9. ^ a b Truscott, John (September 24, 1998). "MDOT Accepts Responsibility for 120 Miles of Local Roads" (Press release). Michigan Department of Transportation. Archived from the original on February 18, 2005. ^ MDSH (1972), §§ L9–M9; MDSH (1973), §§ L9–M9. ^ MSHD (1957a), § L9; MSHD (1957b), § L9. ^ MSHD (1963), § M9; MSHD (1964), § M9. ^ MDSH (1970), §§ J7–K7; MDSH (1971), §§ J7–K7. ^ MDSH (1971), § K7; MDSH (1972), § K7. ^ a b MDSH (1970), §§ J8–K8; MDSH (1971), §§ J8–K8. ^ MSHD & Rand McNally (1936a), §§ J8–K8. ^ MSHD (1958), §§ J8–K8; MSHD (1960), §§ J8–K8. ^ MDSH (1970), §§ K8–K9; MDSH (1971), §§ K8–K9. ^ MDSH (1970), §§ J7–J8; MDSH (1971), §§ J7–J8. ^ a b MDOT (1984), §§ J8–J9; MDOT (1985), §§ J8–J9. ^ MDOT (1999), §§ J8–J9. ^ MDSH (1970), §§ G9–G11; MDSH (1971), §§ G9–G11. ^ MDSH (1970), § G10; MDSH (1971), § G10. ^ MDSH (1970), §§ F9–F10; MDSH (1971), §§ F9–F10. ^ MDSH (1972), §§ F9–F10; MDSH (1973), §§ F9–F10. ^ MDOT (1984), §§ E10–F11; MDOT (1985), §§ E10–F11. ^ a b MDSH (1970), §§ E10–E11; MDSH (1971), §§ E10–E11. ^ MDSH (1972), § F9; MDSH (1973), § F9. ^ a b MDSH (1972), § F10; MDSH (1973), § F10. ^ MDSH (1970), § E10; MDSH (1971), § E10. ^ MDOT (1982), § F10; MDOT (1983), § F10. ^ MDSH (1970), §§ E10–F10; MDSH (1971), §§ E10–F10. ^ MDSH (1970), §§ L12–M12; MDSH (1971), §§ L12–M12. ^ MDSH (1970), §§ M11–M12; MDSH (1971), §§ M11–M12. ^ Jennings, Ken (May 26, 2015). "On the Road to Hell (Michigan)". Maphead. Condé Nast Traveler. Archived from the original on January 7, 2016. Retrieved January 19, 2016. ^ MDSH (1970), §§ F11–G11; MDSH (1971), §§ F11–G11. ^ MDOT (2015), §§ F11–G11. ^ MDSH (1970), §§ E11–F11; MDSH (1971), §§ E11–F11. ^ MDSHT (1979), §§ H11–H12; MDOT (1980), §§ H11–H12. ^ a b MDOT (1984), §§ H11–H12; MDOT (1985), §§ H11–H12. ^ MDOT (2003), § H11; MDOT (2004), § H11. ^ MDSHT (1977), § H12; MDSHT (1978), § H12. ^ MDOT (1984), § H12; MDOT (1985), § H12. ^ MDSHT (1977), §§ H11–H12; MDSHT (1978), §§ H11–H12. ^ MDOT (1984), §§ E12–F12; MDOT (1985), §§ E12–F12. ^ MDSHT (1977), §§ H12–H13; MDSHT (1978), §§ H12–H13. ^ MDOT (1984), §§ H12–H13; MDOT (1985), §§ H12–H13. ^ MDSHT (1977), §§ H10–H12; MDSHT (1978), §§ H10–H12. ^ MDOT (1984), §§ H10–H12; MDOT (1985), §§ H10–H12. ^ MDOT (2003), § H10; MDOT (2004), § H10. ^ MDSH (1973), §§ H12–H13; MDSHT (1974), §§ H12–H13. ^ MDOT (1982), §§ G10–G11; MDOT (1983), §§ G10–G11. ^ MDSH (1970), §§ G10–G11; MDSH (1971), §§ G10–G11. ^ MDSH (1973), §§ G13–H13; MDSHT (1974), §§ G13–H13. ^ MSHD & Rand McNally (1936a), §§ G13–H13; MSHD & Rand McNally (1936b), §§ G13–H13. ^ MSHD (1960), §§ G13–H13; MSHD (1961), §§ G13–H13. ^ MDSH (1970), § G11; MDSH (1971), § G11. ^ MDSH (1970), § F11; MDSH (1971), § F11. ^ MDSH (1971), §§ F11–I11; MDSH (1972), §§ F11–I11. ^ MDSH (1970), § F5; MDSH (1971), § F5. ^ MDSH (1970), §§ F4–F6; MDSH (1971), §§ F4–F6. ^ MDSH (1972), § E5; MDSH (1973), § E5. ^ MDSH (1972), §§ D4–E6; MDSH (1973), §§ D4–E6. ^ a b MDOT (1991), §§ D4–E6; MDOT (1992), §§ D4–E6. ^ MDSH (1972), §§ D5–E6; MDSH (1973), §§ D5–E6. ^ MDOT (2002), §§ D5–E6; MDOT (2003), §§ D5–E6. ^ MDSH (1972), § D5; MDSH (1973), § D5. ^ MDOT (2002), § D5; MDOT (2003), § D5. ^ MDSH (1972), §§ D5–E5; MDSH (1973), §§ D5–E5. ^ MDSH (1972), §§ C6–D6; MDSH (1973), §§ C6–D6. ^ a b MDSH (1972), § C6; MDSH (1973), § C6. ^ a b c MDSH (1972), § C7; MDSH (1973), § C7. ^ MDSH (1973), §§ C7–D6; MDSHT (1974), §§ C7–D6. ^ a b c MDOT (2004), § C7; MDOT (2005), § C7. ^ MDSH (1972), §§ C7–D7; MDSH (1973), §§ C7–D7. ^ Google (July 2011). "Streetview of M-28 and H-13/FFH-13 Junction" (Map). Google Maps. Google. Retrieved January 19, 2016. ^ MDOT (1983), §§ B3–D3; MDOT (1985), §§ B3–D3. ^ MDOT (1992), §§ B3–D3; MDOT (2015), §§ B3–D3. ^ MDSH (1970), §§ C9–D9; MDSH (1971), §§ C9–D9. ^ MSHD (1929); MSHD & H.M. Gousha (1930). ^ MSHD (1960), §§ C8–D8; MSHD (1961), §§ C8–D8. ^ MDSH (1970), §§ B9–C9; MDSH (1971), §§ B9–C9. ^ MDSH (1970), §§ D9–C11; MDSH (1971), §§ D9–C11. ^ MSHD (1960), §§ D9–C11; MSHD (1961), §§ D9–C11. ^ a b MDSH (1970), §§ C8–C9; MDSH (1971), §§ C8–C9. ^ MSHD (1961), §§ C9–C9; MSHD (1961), §§ C8–C9. ^ MDSH (1972), § D10; MDSH (1973), § D10. ^ MDSH (1972), §§ C7–B9; MDSH (1973), §§ C7–B9. ^ MDOT (2015), § C8. ^ MDSH (1972), §§ C11–D10; MDSH (1973), §§ C11–D10. ^ MSHD & Rand McNally (1933a), §§ C11–D10; MSHD & Rand McNally (1933b), §§ C11–D10. ^ MSHD (1962), §§ C11–D10; MSHD (1963), §§ C11–D10; MSHD (1964), §§ C11–D10. Michigan State Highway Department (July 1, 1919). State of Michigan (Map). Scale not given. Lansing: Michigan State Highway Department. Upper Peninsula sheet. OCLC 15607244. Retrieved December 18, 2016 – via Michigan State University Libraries. ——— (December 1, 1927). Official Highway Service Map (Map). [c. 1:810,000]. Lansing: Michigan State Highway Department. OCLC 12701195, 79754957. ——— (May 1, 1929). Official Highway Service Map (Map). [c. 1:810,000]. Lansing: Michigan State Highway Department. OCLC 12701195, 79754957. ——— & Rand McNally (May 1, 1933a). Official Michigan Highway Map (Map). [c. 1:840,000]. Lansing: Michigan State Highway Department. OCLC 12701053. Retrieved December 18, 2016 – via Archives of Michigan. ——— & ——— (June 1, 1936a). Official Michigan Highway Map (Map). [c. 1:850,000]. Lansing: Michigan State Highway Department. OCLC 12701143. ——— & ——— (December 15, 1936b). Official Michigan Highway Map (Map) (Winter ed.). [c. 1:850,000]. Lansing: Michigan State Highway Department. OCLC 12701143, 317396365. Retrieved December 18, 2016 – via Archives of Michigan. ——— (April 1, 1957a). Official Highway Map (Map). [c. 1:918,720]. Lansing: Michigan State Highway Department. OCLC 12701120. Retrieved May 21, 2017 – via Archives of Michigan. ——— (October 1, 1957b). Official Highway Map (Map). [c. 1:918,720]. Lansing: Michigan State Highway Department. OCLC 12701120, 367386492. Michigan Department of State Highways (1970). Michigan, Great Lake State: Official Highway Map (Map). c. 1:918,720. Lansing: Michigan Department of State Highways. OCLC 12701120. ——— (1977). Michigan, Great Lake State: Official Transportation Map (Map) (1976–1977 ed.). c. 1:918,720. Lansing: Michigan Department of State Highways and Transportation. OCLC 12701177. ——— (1978). Michigan, Great Lake State: Official Transportation Map (Map) (1978–1979 ed.). c. 1:918,720. Lansing: Michigan Department of State Highways and Transportation. OCLC 12701177. ——— (1979). Michigan, Great Lake State: Official Transportation Map (Map) (1978–1979 ed.). c. 1:918,720. Lansing: Michigan Department of State Highways and Transportation. OCLC 12701177. Michigan Department of Transportation (1980). Michigan, Great Lake State: Official Transportation Map (Map) (1980–1981 ed.). c. 1:918,720. Lansing: Michigan Department of Transportation. OCLC 12701177, 606211521. ——— (1983). Say Yes to Michigan! : Official Transportation Map (Map). c. 1:918,720. Lansing: Michigan Department of Transportation. OCLC 12701177. ——— (1991). Celebrate the Great Lakes, Yes Michigan: Michigan Department of Transportation Map (Map). c. 1:918,720. Lansing: Michigan Department of Transportation. OCLC 42778335. ——— (1992). Celebrate the Great Lakes, Yes Michigan: Michigan Department of Transportation Map (Map). c. 1:918,720. Lansing: Michigan Department of Transportation. OCLC 42778335, 318947496. ——— (2002). Michigan, Great Lakes Great Times: Official Department of Transportation Map (Map). c. 1:918,720. Lansing: Michigan Department of Transportation. OCLC 42778335. ——— (2003). Michigan: Official Department of Transportation Map (Map) (2003–2004 ed.). c. 1:918,720. Lansing: Michigan Department of Transportation. OCLC 42778335. ——— (2004). Michigan: Official Department of Transportation Map (Map) (2003–2004 ed.). c. 1:975,000. Lansing: Michigan Department of Transportation. OCLC 42778335, 53197160. This page was last edited on 20 February 2018, at 04:36 (UTC).